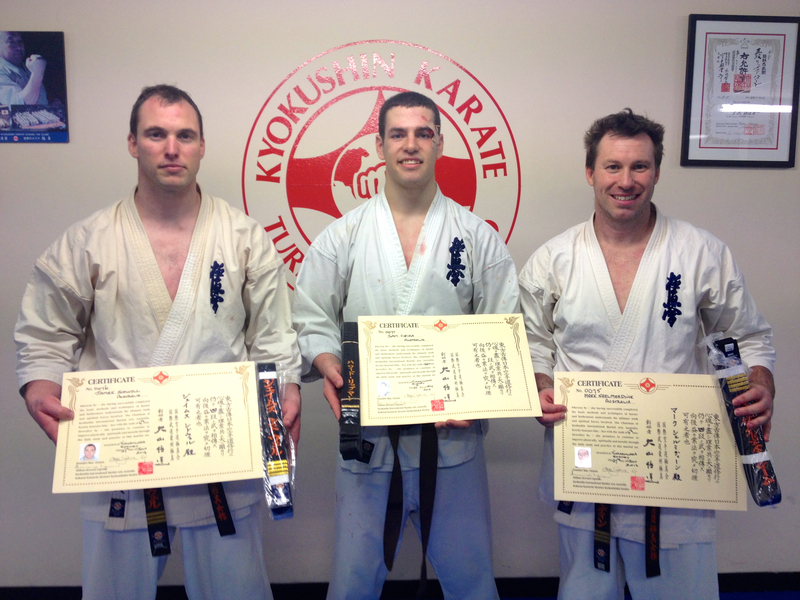 Sensei James Sidwell (4th Dan), Sempai Sammy Vieira (1st Dan) and Sensei Mark Shelmerdine (4th Dan) with their new belts & certificates. 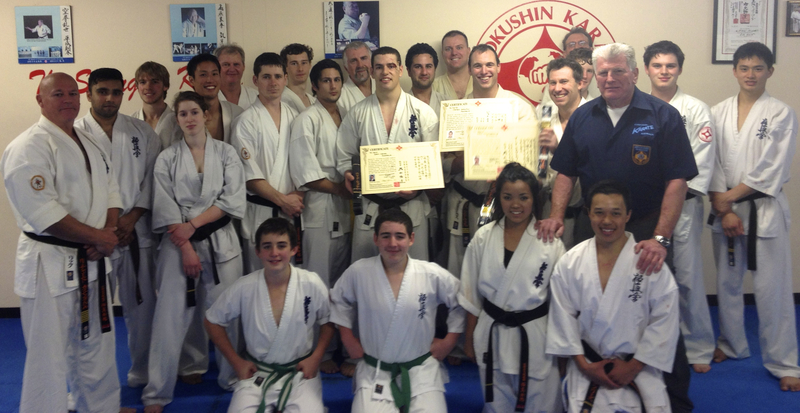 On Saturday the 27th of July, black belts and senior kyu grades attempted a Karate grading. Basic techniques and stances, combinations, partner work, terminology, kata, fitness and fighting skills were tested rigorously. KIMAA students from Turramurra and Annangrove Dojos participated, as well as Jeremy Gray from the North Coast, with Sensei Mark McFadden and Sempai Wally Gray also coming down. Sensei Mark Shelmerdine and Sensei James Sidwell, long-time instructors and examples of the Kyokushin way, were graded to 4th Dan (Yondan). 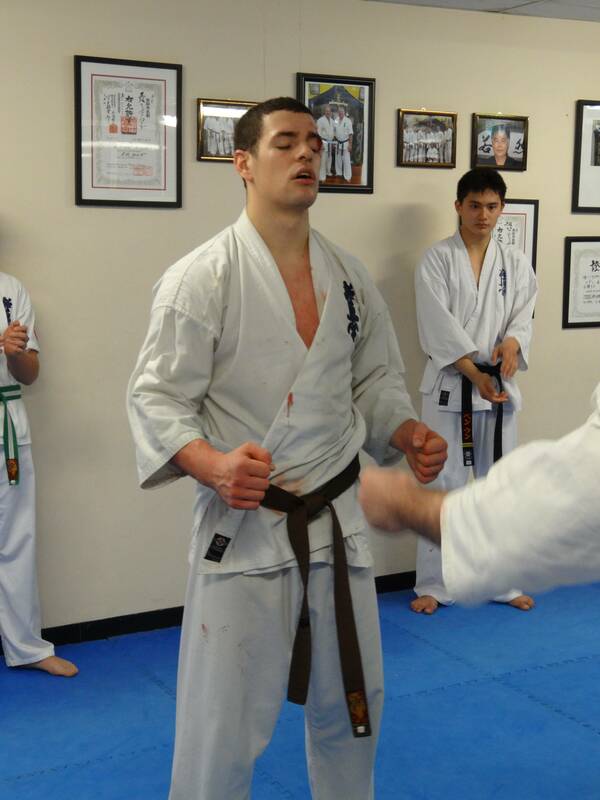 Sempai Sammy Vieira was graded to 1st Dan (Shodan). KIMAA’s newest Shodan fought his forty fights bravely, despite a couple of bloody knock-downs that required patching up between bouts. Sempai Sammy Vieira after his forty fights for Shodan. All students put in a commendable effort, including Stephen Runge, James Ruprai, Azann Vhora and Jason Lambe who achieved senior brown belt (1st Kyu). Jeremy Gray and Angus and Victor Sweeney also did very well, keeping up with the adults in a long grading. It was also announced at the completion of the grading that Sensei Mark McFadden had been promoted to 2nd Dan (Nidan) in Kobudo. Sensei Mark leads instruction in Kobudo in KIMAA’s North Coast Dojos and will be attending a group trip to Okinawa in November. The KIMAA instructors congratulate all those who graded and thank the other seniors who attended the grading to support – and fight – those participating. Shihan Howard Lipman (8th Dan) was pleased with the standard of the day and offers his congratulations to all those who graded. Group shot from the day.